Size: 40mm x 40mm x 4mm. 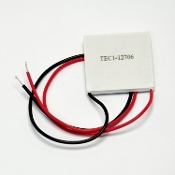 Operates from 0~15.2V DC and 0~6A. Operates Temperature: -30¡æ to 70¡æ. Max power consumption: 60 Watts. These devices must be used in conjunction with a heat sink to avoid burned. Each device is full inspected and tested. Fitted with 6-inch insulated leads.